Shortly after the Great War, Arnold Bennet wrote two very good novels about money, its joys and its terrors. The hero of Mr Prohack suddenly comes into a fortune, and Bennett analyses the change that this makes in the habits of a previously cautious civil servant, as he discovers exciting new worlds of possibility. Riceyman Steps is about the negative effect of money. Henry Earlforward is a miser, dominated by the need to let go of nothing that he has accumulated. There is a hint in the book that “The truth is, we haven’t been straight since 1914.” as though the obsessive-compulsive disorder is a defence against chaosand an internalising of wartime controls and rationing. 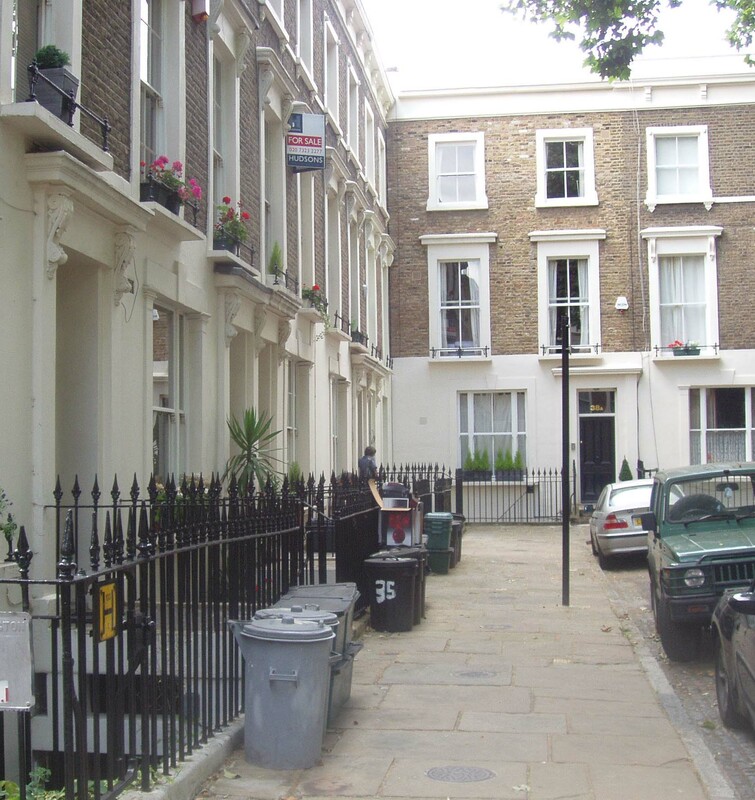 The novel contains one of my favourite sequences in twentieth-century literature, the Sunday morning walk that Henry Earlforward and his bride-to-be, Mrs Arb, take through the squares of Clerkenwell. On Wednesday my wife and I followed their path, enjoying a stroll though part of London that neither of us knew well ( thus giving ourselves, Henry would have noted with approval, a very economical afternoon’s entertainment). The Steps lead up from the Kings Cross Road, and at first we thought they might have vanished. Kings Cross Road itself is unrecognizable from Bennett’s description. 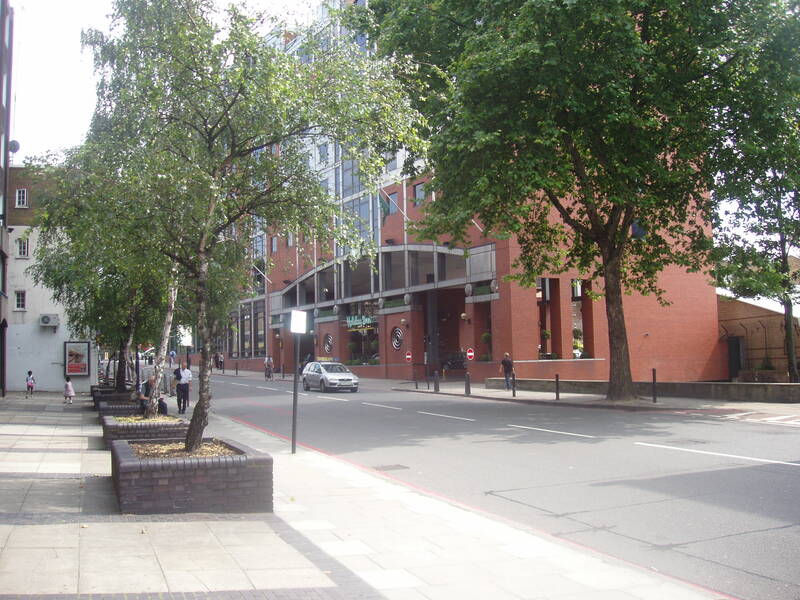 The “huge, red Nell Gwynn’s Tavern” is no more, and nor is Rowton House – a refuge for the homeless (or as Bennett put it: “for the accommodation of the defeated and the futile at a few coppers a night, and displaying on its iron facade a newspaper promise to divulge the names of the winners of horse-races.” That is now a Holiday Inn. At the place we were expecting to find the turning towards the Steps was a huge Travelodge hotel, built in the modern-cheesy style. 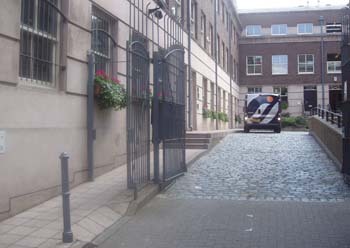 Go through the Travelodge arch, though, and you find the steps, in Gwynne Place, leading up to Granville Square, which Bennett re-christened Riceyman Square. The biggest difference is that the steps no longer lead up to a church. St Andrew’s, according to Bennet, had “architecturally nothing whatever to recommend it. Its general proportions, its arched windows, its mullions, its finials, its crosses, its spire, and its buttresses, were all and in every detail silly and offensive.” Now it is gone. Its churchyard, “a garden flanked by iron rails” still exists;it is no longer a padlocked place, but a public one, looking slightly scruffy. Where the church once stood, there is a children’s playground, and a basketball court. The Square had once been genteel; it ought now to have been picturesque, but it was not. It was merely decrepit foul and slatternly. Another eighty years have passed, and once again the Square is definitely genteel. The paint is fresh and bright, and there are no broken windows. Property in this part of London is much sought after, and extremely expensive. Dealing with Elsie means that Mrs Arb is late for the church service (to Henry’s relief). 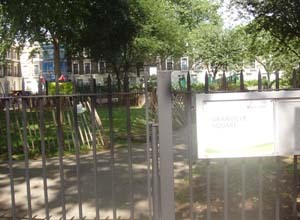 He offers to show her Clerkenwell, and takes her on to Wilmington Square, a larger and more imposing place, with “lofty reddish houses, sombre and shabby, with a great railed garden and great trees in the middle, and a wide roadway round.” It is a place that Mrs Arb had never heard of before, and neither had I. It is very impressive, and the garden is beautiful. The day we visited was the first of the school holidays, and some local children, under the supervision of their jolly mums, were having a brilliantly raucous and messy time. They had bags of flour and were bombarding each other without mercy. Some water and eggs may have added to the chaos. 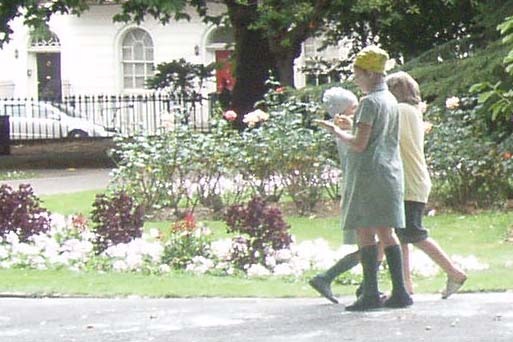 This is a long-standing summer-holiday ritual in these parts, apparently, though one of the mothers told us that there had been objections to the kids enjoying themselves in one of the other squares, so they came to Wilmington Square, which allowed it. This is the most totally changed part of the whole walk. Coldbath Square is now super-smart, in the postmodern style, with mock-antique cobbles and heritage-looking street furniture setting off the smart brick buildings. Are the bars and gates an “ironic” reference to the terrible Coldbath Fields prison, once not far from here? This was indeed once a grim part of London. 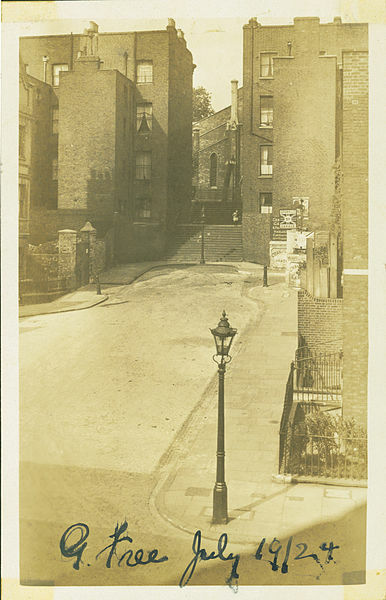 Just across the road from Coldbath Square was Mount Pleasant – now (and in Bennett’s day) the biggest London postal sorting office, but given its name sarcastically when it was the capital’s main rubbish tip. On the ground floor lived a meat-salesman, his wife and three children, the eldest of whom was five years of age. Three rooms and some minute appurtenances on this floor. The meat-salesman shouted and bawled cheap bits of meat in an open-fronted shop in Exmouth Street during a sixty-hour week which ended at midnight on Saturday. Exmouth Market is now very gentrified. Was there still a butchers of any kind? There were hardly any proper shops at all, just sort-of-Italian restaurants, and bars. But there was one terrific old-style ironmonger’s shop, crowded out with hardware of all sorts. 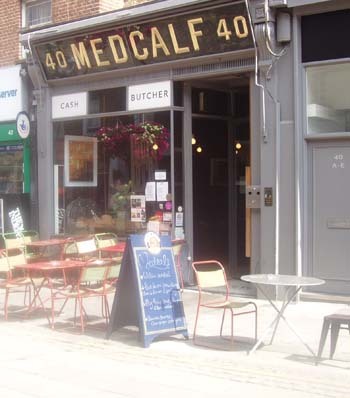 And there was this – the remnants of a butcher’s, now transformed into a cafe. Do all the locals go elsewhere for their shopping now? Is there a mega-Tesco supermarket nearby which has put all the proper shops out of business? 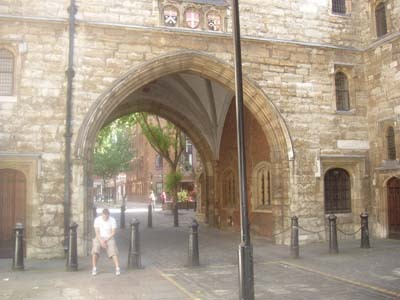 Onwards, past St James’s Church, (but with no sight, alas, of “a second-hand shop where old blades of aeroplane propellers were offered at 3s 6d each”) to the site of “St John’s Gate, the majestic relic of the Priory”. The “huge irregular square” is still “cut in two by a great avenue” – more decidedly on a busy twenty-first century afternoon than on a 1922 Sunday, I should imagine. Past this carefully preserved chunk of antiquity, Mrs Arb decided to venture, taking weary Henry with her, down a small street where a blacksmith was hammering. Signs announced wholesale dealers in rouge, traders in rabbit and mole skins, and a Gorgonzola cheese factory. All gone. Every building now seem to be occupied by graphic designers. Only one thing is unchanged. 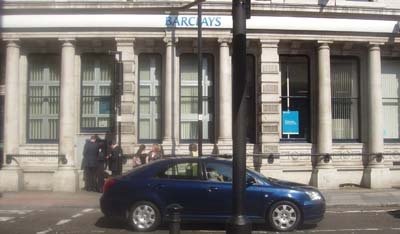 At the end of the road, Mrs Arb exclaims to see a bank. Now A.B.C. shops and Lyonses have disappeared as definitely as that gorgonzola factory, but Barclay’s Bank remains (and I doubt whether Mrs Arb would trust it any more today, in these sub-prime times). It was a most enjoyable walk. Did it cast much light on the novel? Well, it was good to see Granville Square and Wilmington Square. Otherwise it was a lesson in how much this part of London has changed over eighty years. For the better, mostly – the squalor has gone, though a new sort of uniformity has replaced that of shabbiness in some places. The walk also showed how London is still full of variety, and capable of surprises. Heading off the main roads, one sees how many ordinary people still manage to live in the heart of the city, and how they are adapting it to their own purposes, and how they are finding newer ways to make money. Arnold Bennett would have been interested. 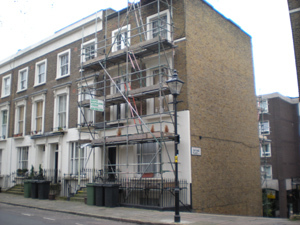 The garden in Granville Square is full of blossom and Henry Earlforward’s house is clad in scaffolding – suggesting large-scale redecoration of a type that parsimonious Henry might not have been comfortable with. This entry was written by George Simmers and posted on July 27, 2008 at 1:37 pm and filed under History, novels, personal. Bookmark the permalink. Follow any comments here with the RSS feed for this post. Post a comment or leave a trackback: Trackback URL. Love this blog. Thought the ‘then and now’ photos fascinating – I regularly try to imagine how Bristol (my city) might have looked 100 – ish years ago. I had a few spare hours in London yesterday and decided to look for the setting of Riceyman Steps. I had not read this excellent blog so instead headed for Clerkenwell Green. Alas no longer green! I remembered the story told by Henry’s uncle, T.T. Riceyman, about the horrific sinking of the excavations for the underground in 1862 near Clerkenwell Green. Thank you for the photos and explanation. I will know where to go next time. ‘The illimitable interior had four chief colours: bright blue of the painted constructional ironwork, all columns and arches; red-pink-ivories of meat; white of the salesmen’s long coats; and yellow of electricity. Hundreds of bays, which might or might not be called shops, lined with thousands of great steel hooks from each of which hung a carcass, salesmen standing at the front of every bay, and far at the back of every bay a sort of shanty-office in which lurked, crouching and peering forth, clerks pen in hand, like devilish accountants of some glittering, chill inferno. ‘One long avenue of bays stretched endless in front, and others on either hand, producing in the stranger a feeling of infinity. Many people in the avenues, loitering, chatting, chaffing, bickering! And at frequent intervals market-porters bearing carcasses on their leather-protected shoulders, or porters pushing trucks full of carcasses, sped with bent heads feverishly through the avenues, careless of whom they might throw down or maim or kill. An impression of intense, cheerful vitality, contrasting dramatically with the dark somnolence of the streets around! A dream, a vast magic, set in the midst of the prosaic reality of industrial sleep! You were dead; you stepped at one step into the dream; you were alive. I really enjoyed your ‘Walking Riceyman Steps’ – and wonder whether you might be interested in writing about this novel for a website I moderate. If you are, drop me a line and I’ll explain more … or follow the link to the site. Andrew – thanks for the invitation, which I shall definitely accept. I strongly recommend other readers to take a look at Andrew’s ‘London Fictions’ website. Those interested in Clerkenwell should definitely read the article by Andrew Whitehead on Gissing’s ‘The Nether World’. Hi George – I am still in the market for a piece about the London of Riceyman Steps if you are tempted. Though I’m an avid reader of your marvellous blog I have only just come across your ‘Walking Riceyman Steps’. The ‘then and now’ photos are great. I’m amazed they survived. Riceyman Steps is one of only two novels that I read again from the beginning immediately after finishing it as I was so intrigued by the setting. The other novel I read again straight after a first read was Conrad’s Secret Agent. I notice that both novels are set in shabby-genteel parts of London. 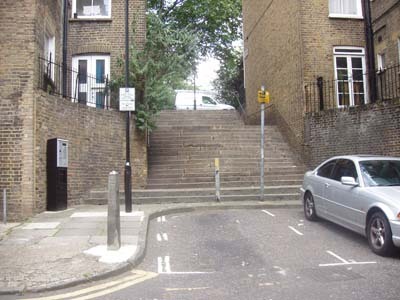 I’m so glad that you will write about ‘Riceyman Steps’ for London Fictions. It’s a wonderful novel, and so evocative of place – as your own website has amply demonstrated. Riceyman Steps is my favourite novel, read and re-read many times. I found your blog today and am delighted. To be able to put ‘faces to names,’ so to speak will increase my pleasure when I next re-read Arnold Bennett’s [IMO] best ever book. A very late comment from me, but I’ve just come across your blog. I was reading Riceyman Steps and wondered if they existed, given the strong sense of place that Bennett achieves. So it was a delight to read your description of your walk around the King’s Road. Do pop over to my blog if you have a moment. It too has a strong Bennett theme. Thank you for an interesting post which I have linked to mine. 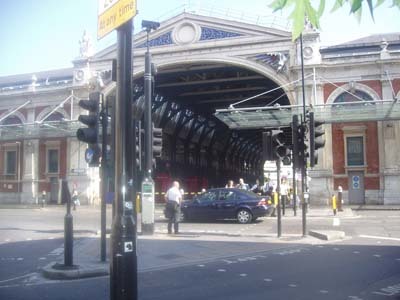 I am exploring London with Bradshaw’s Hand Book to London, 1862, and loving every minute! Thanks for this. I wonder what Bennett would have thought of this nickname. ‘Plum pudding’ has a connotation of succulent plenty that contrasts strongly with poor miserly Henry Earlforward. Maybe you knew my father and grandparents. My grandmothers maiden name was Lucy Armes, she had two sisters and a brother Harry and her dad was called Samuel or Henry. She grew up at 21 Granville Square but when she married my grandfather Oscar Cross they lived at number 8. My father Graham was born in 1950 and had an older sister called Linda. When my mum and dad got married they moved into the upper floors of number 17 above an old Scottish man called Mr Cashin. Myself and my brother grew up in the square and some of the old people I can remember are Jim Baker and his wife and Miss Wharton who lived at number 24 I think. If possible I would love to see a picture of your drawing. I thought it was probably bombed in WWII, but it was victim of parish revision and the CofE presumably shared Bennett’s aesthetic view and thought it wasn’t worth preserving. I think plum pud steps is either dickensian or victorian in origin.Both would seem to fit;my prefered time is dickensian.But what the association might be, with the steps i don’t know nor able to track.I met Olive lloyd Baker the estates owner several times as a child.I remember her as a miss Marple figure.Spinsterish,pleasant and remote.I came across her again in the diaries of James Lees-Milne deservedly regarded as one of the the great english diarists.He was instrumental in setting up the National trust.The two books on Clerkenwell which are definitive and in my view cannot be bettered are the survey of london volumes published a few years ago for english heritage by Yale university Press.They are exhaustive and superb in every way. Many thanks for Walking Riceyman Steps – one of my favourite novels. It reminds me very much of when I tried to track the homes of my ancestors in various places. It’s surprising what still exists! Although sometimes I was very lucky, arriving just before whole streets and factories were demolished. I now live in Australia, so doing this sort of things is more difficult. But,I will certainly follow your route next time I visit London. Thanks again.